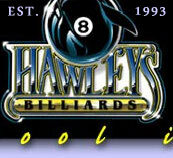 Hawley's Billiards has been in business since 1993 serving the public as a pool room operator as well as an extremely reliable source for a wide selection of billiard and game room equipment. We were one of the first e-commerce billiard equipment dealers that began operating on-line in early 1997. From our first custom pool cue sale in 1993, we have always operated under the philosophy that we will do whatever it takes to keep each and every customer satisfied. We were the first on-line billiard and gameroom equipment dealer that offered what was at that time a unique "100% No Questions Asked Money-Back Satisfaction Guarantee" on all of our products, even on chalked cues. We even offer to pay for any return shipping costs. These practices were unheard of at the time. Since that time, many of our competitors have copied our philosophy, which we are proud to have instigated since we believe it has helped to make the world a better and easier place to live and do business. We were the first to offer 20% or more discounts on the MSRP of major cue manufacturers, which raised the ire of many folks in the industry, since that was also unheard in the mid 1990's. However, we knew that with the internet we were embarking upon a new era of efficiency which made the American-made Custom Cue available to anyone in the world with very little overhead infrastructure necessary, with no need for the usual mark-ups or exorbitant shipping charges heretofore charged by dealers. Most manufacturers have since instituted MAPs, that is, Minimum Advertised Pricing requirements which have limited our ability to make public the prices we would be able to offer were it not for the MAPs. Some cuemakers even refused to let us buy their products for fear we would "cheapen" the perceived value of their products. We understood their concerns and have done our best to be both friend to our customers as well as responsible dealers to our suppliers, by maintaining the MAPs while still offering the best value to our customers in terms of more attentive service, complete reassurance of their satisfaction and by giving them the knowledge that they obtained the best possible deal anywhere on the internet. Our guarantee does not stop at pool cues. We stand behind each and every product from tip tappers to pool table lights, regardless of where we ship our products, be it next door or Japan. We ask that our customers respect our guarantee in a manner that does not take advantage of our generous and fair nature, and return any products as soon as they become aware of their dissatisfaction before the product becomes worn or used too much, especially in the case of custom pool cues as explained further below. That being said, the fact is, we do not care why you may become dissatisfied, though we are usually curious. That's where the "No Questions Asked" part of the guarantee comes in. Even if you wish to return it because the green stain on the forearm of your cue does not match the beautiful green eys of your most beloved, as you had hoped it would, (believe it or not, we actually had a cue returned and refunded for that reason) or any one of a million other reasons why you would like to return your product for a full refund or replacement due to a minor or major dissatisfaction. Because all that matters to us is your satisfaction with your dealings with us. Afterall, why consummate a transaction if one of the parties to the transaction is not happy. Life is too short and we do not make enough money on any product we sell to offset the bad karma or negative effects of an unhappy customer. It's just that simple, plus we like to sleep at nights and be able to wake up and look ourselves in the mirror without any reservations. If you are dissatisfied with your cue or case for any reason, simply return it for a full refund or exchange. We will even credit your credit card for the return shipping charge! All we ask is BEFORE CHALKING that you FIRST INSPECT THE CUE for dings, warping, scratches, etc. as we cannot take back both a chalked and defective (cracked, warped, etc) cue. If you otherwise like your new cue and it is not defective, you may chalk it and test the hit and feel, but please decide if you want to keep or return it after only 15 to 30 minutes of play, (any more and it will show too much wear and tear for us to accept back). Also do not apply any sandpaper, burnishers, steel wool, scotchbrite etc. to the new shaft as this will void this 30 day warranty, otherwise, NO QUESTIONS ASKED AND NO HARD FEELINGS! ! That's right, take 30 minutes to decide if it's the cue or case for you, but you have 30 days to make arrangements for its return. We stand behind all of the products we offer and sell and such items may be returned within 30 days for a full refund, HOWEVER DAMAGE CLAIMS MUST BE MADE IN 7 DAYS by calling our toll free number, 214-632-9060 or emailing us with your intentions, primarily because shipping damage claims must be made very fast or the shipping companies will not honor the claim, even if they did the damage, if not claimed very quickly. We will pay for return shipping for all cues and almost all other items in almost all cases, and most definitely if we shipped the wrong product or the product was damaged during shipment. Please keep and return all packaging materials to prove damages incurred during shipment so we may in turn file any necessary claims with the shipping company. Call 214-632-9060 to arrange for UPS or Fed Ex returns (often referred to as a Call-Tag) and have your ordering information or invoice available for call. All merchandise should be returned in the original packaging materials. Your refund will be the same as the original form of payment, i.e. credit card, PayPal, check, etc. We do not charge any restocking fee in any circumstance. Finally, we will match any advertised price on the Internet on the off-chance that we are not already the lowest!!! Well if you have read this much this far, you have truly done your homework, for which we congratulate your tenacity and thoroughness. Let us conclude by reassuring you that we truly do operate day-to-day with this philosophy and will always be just a phone call away at our number, 214-632-9060 to handle any details related to making you a happy customer, regardless of the circumstances. Just received my SP4RW early this morning and I shot with it all day after work... until league and it hits like a dream! I've owned all steel jointed cues and I knew I wanted something with an implex/wood to wood joint since I've recently found out that I prefer a softer hit and WOW this cue is everything I could've asked for! I received the cue tonight. yes is wonderful when a plan like this come together. I can't wait to break with the cue tomorrow. I forgot to mention, I received last package already. The cues were in excellent condition, thank you! I received the cue last yesterday, this item came "perfect" with no damage. Thank you very much, it was very pleasant to deal with you. Just one question, it's my first cue, and i don't know if it need any preparation for the tip, it look glossy, is it necessary to grind it with sandpaper. Re: 2nd Annual "Pool Hall Brawl!" I greatly appreciate you coming by and dropping off the cues. They are great looking cues! I’d like to keep them for myself, but alas I have to give them away. Once we get the display cases made I’ll shoot you over a picture of what they look like. Carroll Nickens posted on our Facebook Wall. "I bought my Schon Cue (LTD 804) from Hawley's in '03. Great cue and terrific customer service." Got my cue today. Perfect. I’m very happy.